“Hi, my name is Bandit. 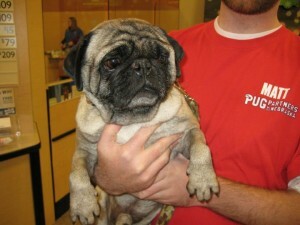 I am a 4 year old male fawn pug. I am neutered and up to date on my shots. I am potty trained and crate trained. I’m guessing I am 22 lbs., but am not overweight, just big boned. I’ve got some long legs. I get along great with my foster pug brothers and sister. I also met a few kids who taught me to sit, stay, and down. Boy that was fun! My foster mom says I’m very smart. I really enjoy chasing balls and love to play with soft toys and chew on bones. What can I say, I’m easy. I will hangout in the backyard and just enjoy the freedom. I don’t like not getting enough attention and when I have to go to in the crate. How soon after putting in an application should we hope to hear from you? Hi Janie! You should be hearing from one of our volunteers within a few days. We are all volunteers, so sometimes it may take a bit to hear back from us. :-) Thanks for submitting an application!